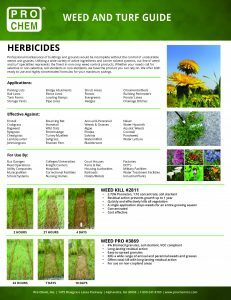 WEED KILL | Pro Chem, Inc.
WEED KILL is designed for use where control of all vegetation is desired. This emulsifiable, total-kill herbicide works primarily through the roots, requiring adequate rainfall to move the product into the root zone. The degree of control and duration depends on the amount of WEED KILL applied, rainfall, soil type and temperature at the time of application. Recommended to use in non-cropland areas, away from the roots of desired plants, brush, foliage and trees. Application should be outside of the drip line of trees. Do not use this product in recreational and residential areas. 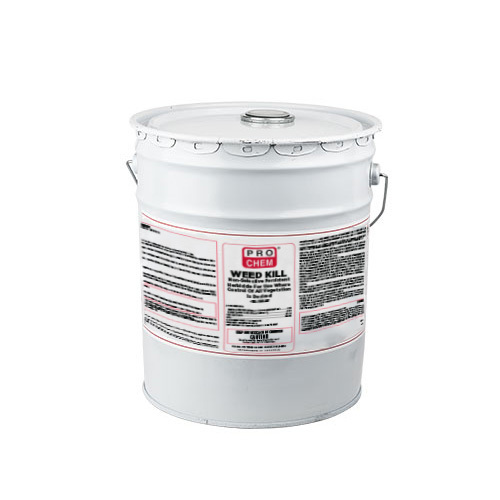 Typical Application: Mix 1 gallon with 10 gallons of water and apply over 1,000 square feet. Hard to Control Weeds: For hard-to-control perennials and grasses such as Johnson grass, bindweed and wild carrot, use 1 ½ to 1 2/3 gallons mixed with 10 gallons of water per 1,000 square feet.